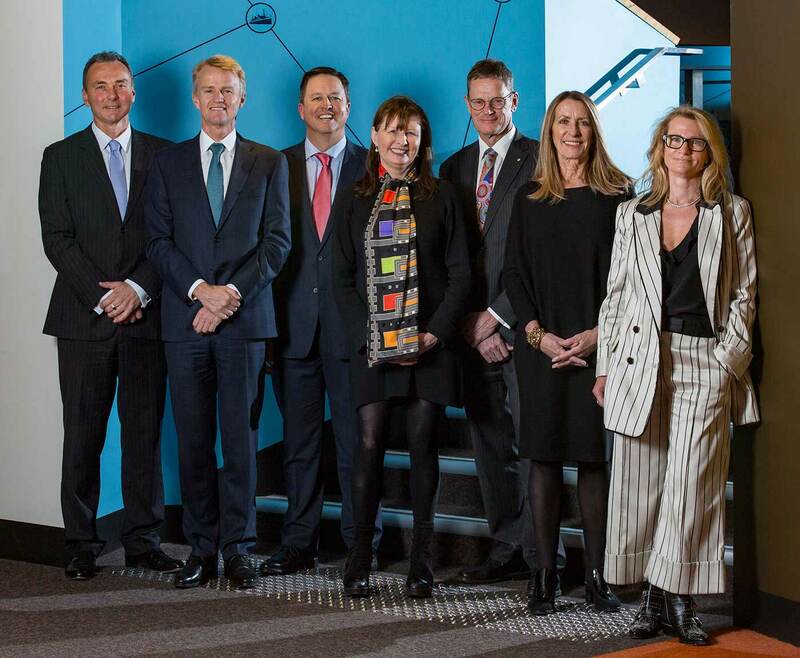 The Council of the National Museum of Australia is responsible for the overall performance of the organisation, including setting the strategic direction and establishing goals for management. The Council works with executive management in developing, executing, monitoring and adjusting the appropriate strategies, and its non-executive members are appointed by the Governor-General in accordance with Subsection 13(2) of the Museum Act. The Museum Act provides for a Council consisting of a Chair, the Director of the Museum and between seven and 10 other members. All members are appointed by the Governor-General and, apart from the Director, are part-time appointees for terms of up to three years, although terms of appointment can be renewed. The Director is appointed by the Governor-General in accordance with Section 23 of the Museum Act, and can hold office for a period not exceeding seven years. The Museum provides Council members with information on changes to corporate governance responsibilities as it becomes available, including Australian National Audit Office documents and guidelines. The Council has procedures for the disclosure and resolution of any matter for its consideration that may result in a conflict of interest. Members are required to make the nature of that interest known at the commencement of a Council meeting, and details of such disclosures are recorded in the minutes of the meeting. The Commonwealth Remuneration Tribunal determines remuneration for non-executive members. In 2016–17, there were no deputies of part-time members appointed under Section 15(1) of the Museum Act, and no directions to the Council by the Minister. Council of the National Museum of Australia (left to right) Dr Mathew Trinca, David Jones, Ben Maguire, Professor Catharine Lumby, Michael Traill AM, Maureen Plavsic and Dr Janet Albrechtsen. Absent is Alexander Hartman. Mr David Jones, Chair (MBA, Harvard Business School; BEng (Hons), University of Melbourne), is Executive Chairman of VGI Partners, a global equities absolute return fund manager. He spent 17 years in private equity (1994–2011), as Managing Director at CHAMP Private Equity, Executive Director and Country Head of UBS Capital, and a division director at Macquarie Direct Investment. He is Chairman of VGI Partners Global Investments Limited (ASX: VG1) and Derwent Executive, and a non-executive director of EMR Capital, Global Sources Limited (NASDAQ: GSOL) and Cape York Partnership. Mr Jones attended 4/4 meetings. Terms: 25 June 2015 – 24 June 2018 (appointed Chair of Council); 30 May 2013 – 29 May 2016 (reappointed); 25 February 2010 – 24 February 2013. Dr Janet Albrechtsen (LLB (Hons), University of Adelaide; Doctor of Juridical Studies, University of Sydney) is an opinion columnist with the Australian, and has written for the Wall Street Journal, Australian Financial Review, Age, Sydney Morning Herald and Canada’s National Post and Vancouver Sun. She is a member of the board of the Institute of Public Affairs. She is also an ambassador and mentor with the Australian Indigenous Education Fund, and formerly a member of the board of the Australian Broadcasting Corporation (ABC), the ABC and SBS boards appointments panel, and the Foreign Affairs Council. Before turning to commentary, she worked as a solicitor in commercial law at Freehill, Hollingdale and Page and taught at the University of Sydney Law School. Dr Albrechtsen attended 3/4 meetings. Term: 11 December 2014 – 10 December 2017. Mr Alexander Hartman (PhD (Creative Arts), James Cook University; MEd Antioch Graduate School of Education; BA (Philosophy and Religion), Keuka College) is an entrepreneur, representative director of Keep Fighting Foundation gGmbh, co-founder of Matilda Media Pty Ltd, RightsTrade and Newzulu Limited. He has served as a member of the Australian Industry Research and Development Board, Director of the Australian Business Foundation Limited, Advisory Board member of Headspace and ambassador of the Sony Foundation. Mr Hartman received the Commonwealth Minister for Youth Affairs Career Achievement Award in 2001 as part of the Young Australian of the Year Awards, and the 2002 New South Wales Pearcey Award. Mr Hartman attended 4/4 meetings. Term: 26 February 2015 – 25 February 2018. Professor Catharine Lumby (PhD (Media and Communication), Macquarie University; BA (Hons), LLB, University of Sydney) is Professor of Media at Macquarie University, where her research spans media services, gender studies and media content regulation. She was the Foundation Chair, Media and Communications Department, Sydney University, and Foundation Director, Journalism and Media Research Centre, at the University of New South Wales, and is a member of the editorial boards of Public Communication Review, International Journal of Cultural Studies and Feminist Media Studies. Since 2004 she has worked in a pro-bono role advising the National Rugby League on cultural change and education programs for players. Before entering academia in 2000 she was a journalist and opinion writer and has worked for the Sydney Morning Herald, the Australian Broadcasting Corporation and the Bulletin. Professor Lumby attended 3/4 meetings. Terms: 30 May 2016 – 29 May 2019 (reappointed); 30 May 2013 – 29 May 2016. Mr Ben Maguire (MBA, Australian Graduate School of Management, University of Sydney) is Chief Executive Officer of the Australian Trucking Association, Chairman of Remount Ltd, Director of Maguire Management, and Deputy Co-Chair of Regional Development Australia, Southern Inland. For eight years he was the Chief Executive Officer of the Australian Stockman’s Hall of Fame and Outback Heritage Centre in Longreach, Queensland. He has been a member of the Slim Dusty Museum Advisory Board, and is a former executive manager of AGL Energy Limited. Mr Maguire attended 4/4 meetings. Term: 20 August 2015 – 19 August 2018. Ms Maureen Plavsic has 30 years of experience in media, advertising and brand marketing, including as Chief Executive Officer, Executive Director and Head of Sales and Corporate Marketing at Seven Network Limited. Ms Plavsic is Director of Ridge Consulting, a board member of Bestest Inc., and was previously a director of 1-Page, Pacific Brands, Macquarie Radio Network and Opera Australia, and a trustee of the National Gallery of Victoria. Ms Plavsic attended 3/4 meetings. Term: 5 May 2016 – 4 May 2019. Mr Michael Traill AM (MBA, Harvard Business School; BA (Hons), University of Melbourne) was the founding Chief Executive Officer of Social Ventures Australia (SVA) from 2002 to 2014, and co-founder and Executive Director of Macquarie Group’s private equity arm, Macquarie Direct Investment. Mr Traill has expertise in philanthropy investment and development and is Director of MH Carnegie & Co and chair of a number of organisations, including Goodstart Early Learning, Assetic Pty Ltd and the SVA Social Impact Fund. Mr Traill attended 4/4 meetings. Term: 5 May 2016 – 4 May 2019.
examine and recommend the Museum’s annual financial statements for Council’s endorsement. Mr Graham Smith (Independent member, 4/4 meetings). Four meetings of the AFRC were held in Canberra on 8 September (no. 79) and 16 November 2016 (no. 80), and 15 March (no. 81) and 10 May 2017 (no. 82). any other matters referred to it by the Council or Director that are relevant to its role. Mr Russell Taylor (0/2 meetings). The IRG meets twice a year. Meetings were held in Canberra on 8 September 2016 (no. 14) and 15 March 2017 (no. 15). Digital strategy, including emerging technologies, digital collection management, augmented reality and user experience.